Boone County residents gathered Friday night at the Albion Country Club to celebrate the successful event. [/caption]Boone County Big Give had reached a total of $162,157 as of Saturday morning, Dec. 3, with more funds coming in through the weekend. This third annual Big Give had already eclipsed last year in number of projects (23) and number of gifts (903). 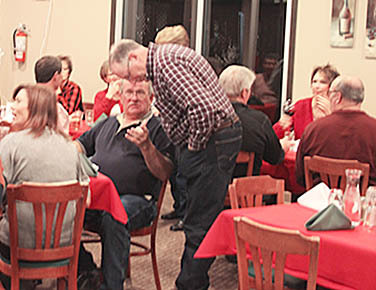 Boone County residents gathered Friday night at the Albion Country Club to celebrate the successful event. Boone County Big Give had reached a preliminary total of $164,472 as of Tuesday morning, Dec. 6, with more funds still coming in. This third annual Big Give had already eclipsed last year in number of projects (23) and number of gifts (939). Last year’s total was $143,000 given for 16 projects, with 807 total gifts. Totals were reviewed Friday night, Dec. 2, at the Big Give Social, and had passed $163,000 at that point. Final gifts and sponsor dollars were yet to be added to the preliminary totals. Sponsor dollars, used for supplementing donor gifts and paying annual fund drive expenses, totaled $23,500. Special events were held Satuday and Sunday, and donations there boosted the total even further. On Saturday, a popular children’s group, “The String Beans” performed at the Boone County Fitness Center. The final Big Give event, held Sunday afternoon, Dec. 4 at 3 p.m., was a performance by singer/songwriter Daniel Christian at the Boone Central High School Gym. • Albion Area Arts Council, enhanced children’s programming, $816 received from 14 donors, $1,500 goal. • Albion Education Foundation, advanced welding program, $1,735 received from nine donors, $10,000 goal. • Albion Public Library, replace book shelves, $3,658 received from 44 donors, $15,000 goal. • Albion Senior Center, replace kitchen flooring, $4,570 received from 52 donors, $5,000 goal. • American Legion Post 162, Legion baseball support, $1,130 received from 17 donors, $5,000 goal. • Beaver Valley Senior Center, St. Edward, sidewalk renovations, $965 received from 38 donors, $5,000 goal. • Boone Central Performing Arts remodel, acoustical improvements in gym, $15,845 received from 116 donors, $68,000 goal. • Boone Central TeamMates, mentor/mentee outings, $985 received from 18 donors, $2,000 goal. • Boone County Area Foundation Fund, unrestricted endowment, $46,105 received from 55 donors, surpassed $20,000 goal. • Boone County Fitness Center, swimming pool beautification, $4,655 received from 32 donors, $15,000 goal. • Boone County Food Pantry, personal care items for those in need, $3,005 received from 43 donors, $5,000 goal. • Boone County Health Center Foundation, small footprint probe, $10,811 received from 107 donors, surpassed $10,000 goal. • Boone County Historical Society, improvements to outbuildings, $2,495 received from 38 donors, $10,000 goal. • Boone County Jr. Leaders 4-H Club, annual livestock shows and educational workshops, $1,275 received from 20 donors, $5,000 goal. • Cedar Valley Community Foundation, cemetery road repairs, $5,440 received from 25 donors, $50,000 goal. • City of Albion/Albion Chamber of Commerce, replace downtown Christmas decorations, $4,220 received from 38 donors, $50,000 initial goal. • Gateway Theatre, hearing impaired sound system, $2,268 received from 44 donors, surpassed $2,000 goal. • Good Samaritan Society – Albion, replace spa/bath house at Wolf Home, $21,069 received from 70 donors, $40,000 goal. • St. Edward Development Co., radar speed signs, $945 received from 20 donors, $2,000 goal. • St. Edward Fire & Rescue, bunker gear for firemen, $3,060 received from 30 donors, $5,000 goal. • St. Edward Public Library, providing a “Little Free Sidewalk Library, $890 received from 19 donors, $1,000 goal. • Village of Petersburg, outdoor fitness circuit, $2,395 received from 35 donors, $10,000 goal. • Village of Primrose, park renovations, $1,160 received from 21 donors, $5,500 goal.